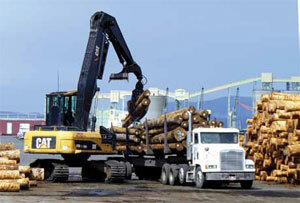 Perched on the banks of the Columbia River in the shadow of an interstate bridge, Teevin Bros. log yard has become a critical regional link in every aspect of the timber industry transportation business, especially international log exports. Over the last decade, under the astute leadership of company owner, Shawn Teevin, the 80-acre site in Rainier, Ore., has been converted from little more than a pile of dredge spoils into a paved, highly efficient inter-modal transportation hub facility that potentially will handle more than 320 MMBF of logs and lumber in 2011, if current levels are sustained. Founded in 1978, Teevin Bros. Land & Timber Company is a modern case study in how the American dream is still possible even in the face of oppressive regulations, rising costs, a sluggish economy, shifting markets, and environmental activism. By seeking solutions to some of the same anxiety-causing problems faced by the timber industry, Shawn Teevin has led his own company in vertical integration, bringing a time of prosperity for Teevin and resulting in positive economic benefits for many in the industry. The visionary investment in the Rainier log yard has boosted the local economy, set the stage to bolster a lagging log market, and expanded markets for regionally-milled lumber by providing a hub that makes water, rail, and road transportation combinations an economical option. Accordingly, the company’s former headquarters at Knappa, Ore., has become a satellite to Rainier. Activities at the log yard dwarf harvesting operations from the 6,000 acres of timberland the company holds. Each month, Teeven handles enough volume to load up four and half ships, and each ship holds about 5.5 MMBF. Investing in improvements at the log yard has been profitable. Initially, a second rail spur of 1,000 feet was added to augment an existing 1,300-foot long siding. Recently both sidings have been extended; one to 1,500 feet and the other to 1,800 feet. Improvements have also included paving 80 acres to allow year-round, all-weather operations at the facility. A 206-foot dock has been replaced by a new 400-foot moorage to accommodate ocean going barge traffic. In 2007, Teevin established a satellite log yard in Eugene to support economical rail transport of export logs harvested in the Willamette Valley to the Rainier facility. And in June 2010, a 44-inch Nicholson debarker went on line to meet requirements that logs exported to China be “bark-less”. “There are substantial risks associated with these types of large investments, but they are already providing returns above what was expected,” says Shawn. Teevin’s Eugene yard consists of five paved acres strategically located for easy highway access and its connection to the short line rail that runs from Eugene to Astoria. The yard operations are supported by four 325 Caterpillar log loaders and two LeTourneau stackers. Logs arriving by truck are loaded on rail cars parked on the yard’s 500-foot spur. This yard was established to reduce costs for one of Teevin’s major customers. Once in Rainier, the logs are trucked to the log owner’s export facility in Longview. The cost of the extra handling required by this arrangement is more than offset by the lower cost of rail transport over trucking expenses. Although the various operations of the company complement and add value to one another, Shawn points out that, importantly, each part of Teevin Bros. Land & Timber Co. — land and timber management, logging contracts, quarries, road building, and log yards — can stand alone if needed. Logs come into the yard by truck, train and barge. Teevin loads and dispatches up to 250 trucks each day. The company adds value by scaling, sorting, decking, debarking, storage, and more. 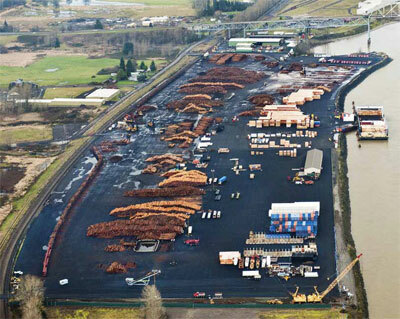 The log yard at Rainier currently serves five major exporters as well as a number of smaller companies. Logs arriving at the yard via truck, train, or barge are received, unloaded, scaled/graded, sorted, staged/decked, debarked as required, tracked, processed/trimmed as required, and eventually reloaded for delivery to their final destination. Lumber arriving by train is assembled into “super bundles” for rapid loading of ocean-going barges. Each step adds value for the customer. Up to 200 inbound trucks and 30 rail cars (the total equivalent of 330 truckloads) are received daily. Outbound logs are shipped via rail to locations south where the logs will be processed into lumber. When loading an export ship at the Port of Longview, Teevin loads and dispatches as many as 250 trucks each day for the short haul across the Columbia River to Longview’s deep-water port. 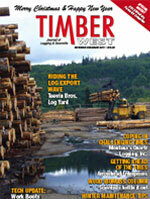 Logs destined for China constitute 95 percent of Teevin’s current log export market. The ability to debark logs at the sort yard is a great asset to log owners since it eliminates the need for extra stages of transport, processing, and handling — and costs are reduced accordingly. Bark is routinely removed from more than 3,500 logs over two shifts before they are trucked to the export facility. Approximately five percent of Teevin’s export logs go to Japan and do not require debarking. Putting current timber markets in perspective, Shawn says, “Only one to two percent of the logs we handle are domestic logs. However, we are handling the volume of logs needed to load out four and a half ships monthly with each vessel holding 5-5.7 MMBF each.” A volume that represents more than 135,000 logs. Teevin’s yard also provides an intermodal transport service for lumber. Finished lumber produced by Oregon mills in the south is delivered by rail to the Rainier yard. There it is reloaded onto barges destined for southern California. The three lumber barges loaded at Rainier every other week constitute 67 percent of the lumber market at major retailers in California. Barge transportation also includes shipping lumber and other goods to Hawaii. Barge shipments to Hawaii are currently supporting all aspects (lumber, steel, other materials) of the construction for numerous projects including an $8 billion light rail system in Honolulu. Some of Teevin’s 100 trucks are used to transport materials to the Rainier yard for loading onto the barge. The Rainier yard crew, working two 10-hour shifts daily, handles trucking, debarking, loading, and unloading. The brief down time allows for maintenance activities. Typically 12-30 trucks operate during the day and eight trucks at night. Yard operations require five LeTourneau stackers, eight log loaders (Caterpillar and Kobelco), and three Caterpiller 966 frontend loaders, not to mention numerous Hyster forklifts of all sizes, plus other rolling stock and support machines. 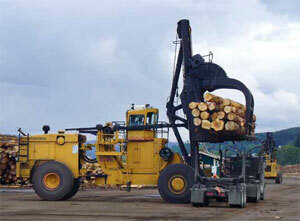 Teevin employs about 160 people companywide, with over 100 of them supporting operations at Rainier’s log yard. In addition, Teevin’s yard at Rainier is “hosting” services and people from four firms and three scaling bureaus. As the company has grown, Shawn has hired a General Manager, Eric Oien. Eric’s extensive background in logs, logging and finance are expected to lead to new growth opportunities. Inventory tracking and control may not be glamorous, but it is a major undertaking vital to effective sort yard operations. Cheryl Konop, Teevin’s operational resources manager says keeping track of all the logs and materials that pass through the sort yard requires specialty accounting software utilizing bar codes on tags affixed to each log handled, dedicated data entry, and dedicated people. Another significant contribution of the Rainier sort yard is its positive impact on regional traffic. Teevin’s intermodal transportation services reduce traffic on the I-5 corridor by over 40,000 trucks each year — reducing road maintenance, fuel consumption, and emissions. By providing a strategically located hub in Rainier, Ore., that interconnects rail, road, and water transportation avenues, Teevin Bros. Land & Timber Co. has not only created a successful operation, it has enabled other businesses to be more successful as well.